Posted on May 29, 2014 by Hawaii's Local Buzz. In the world of specialty or gourmet foods, there are certain buzzwords you run into all the time – like organic, sustainable, non-GMO and Fair Trade. The Fair Trade label might be the least understood of these four, but it’s an important one to learn. What does the Fair Trade Label Mean? The Fair Trade label is only applied to foods and products that are sourced from outside of the United States. Fair Trade practices are designed to help protect farmers in developing countries from the exploitation of their natural resources and talents. Originally applied only to coffee, the fair trade label has been extended to other product categories, including cacao (chocolate). The label means that the U.S.-based companies importing products from developing nations make sure farmers are fairly compensated for their work. Fair Trade USA also works with developing nations to build sustainable businesses that have a positive impact on the local communities. It’s a non-profit, but it is not a charity. As mentioned above, the Fair Trade USA label was created to help developing countries. Unfortunately, coffee grown in Hawaii cannot be certified Fair Trade, because Hawaii doesn’t qualify (obviously) as a developing country. 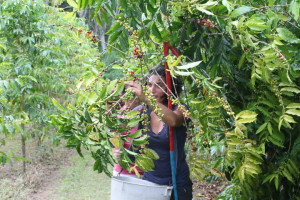 However, coffee farmers in Hawaii, many of whom farm in areas that are economically depressed, face many of the same issues that their brethren in developing nations face. Consumers have to do a little more homework on their own to determine whether or not the foods made from agricultural products grown in the United States are being made by companies whose business practices are consistent with the principles of Fair Trade. Here at Hawaii’s Local Buzz, we produce artisan foods from Hawaii with a sustainable focus. Our coffee and our macadamia nuts are all grown, harvested and processed in our local farming community. We are committed to ensuring that our partner farmers are fairly compensated for their products and share in our success; this is our very first priority. 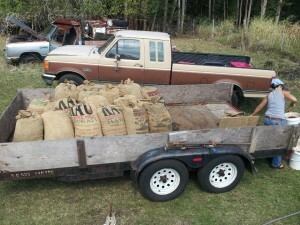 Our partner farmers grow the very best coffee and are cherished members of our ‘Ohana (extended family). And we source our chocolate from Guittard, a company equally committed to Fair Trade practices in their industry. Are you looking to purchase high-quality coffee, chocolate and other artisan foods from Hawaii? Place your order with us and know your dollars are being spent for the good of the whole.